Take a bite of this classic homemade Rosemary Bread and you won’t regret it. Pair this rosemary bread recipe up with any number of soups, and you will totally understand why we love this bread so much. Whether you choose to serve it with our Copycat Olive Garden Zuppa Toscana, or Meat & Potato Parsley Soup, rosemary dinner bread is the perfect choice. Macaroni Grill Bread Copycat is Delicious! We particularly love it with Chicken and Vegetable Chowder. 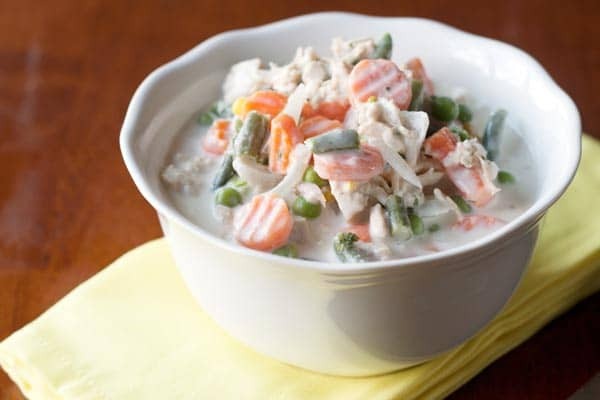 Chicken and Vegetable Chowder is just a heart and belly warming soup that is full of chunky goodness. 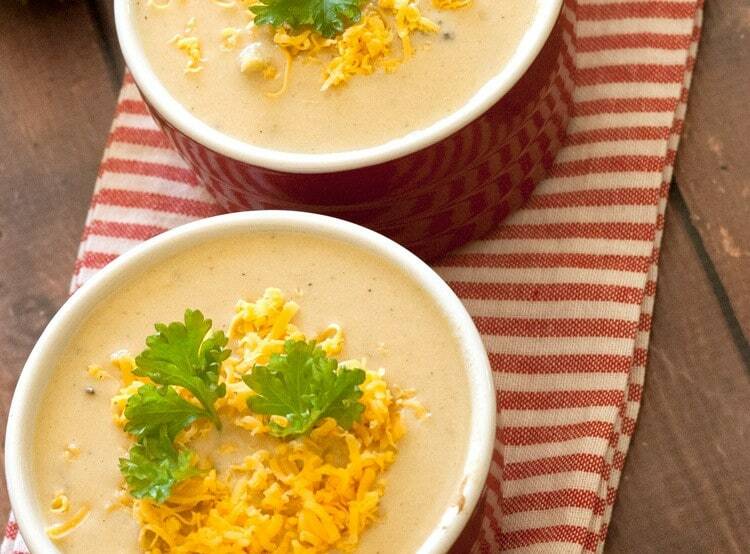 If you like creamy soups AND love chunky soups, you will absolutely adore this one. It pretty much tops our list for the perfect soup to eat on a cool day because it is the perfect comfort food! You can now recreate this delicious appetizer in your own home to enjoy whenever you please. As good as this bread is simply on its own, try slicing it for gourmet sandwiches or dipped in your favorite soup. 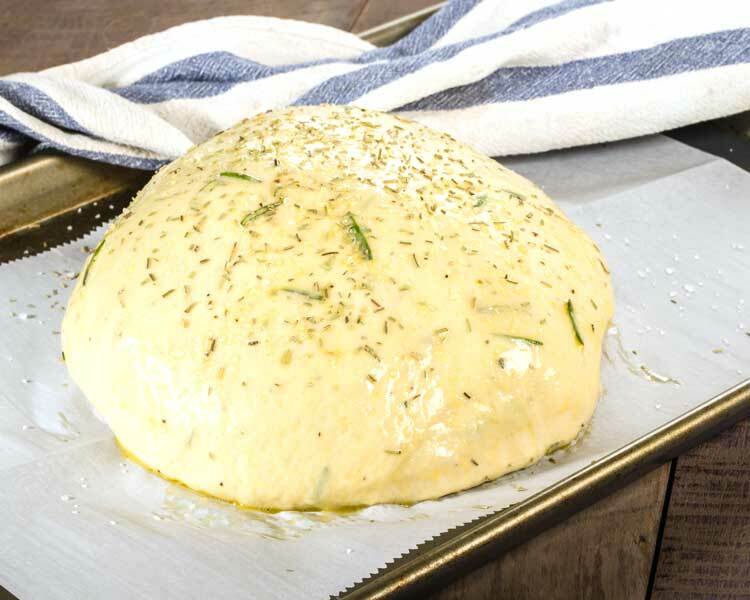 You can turn this recipe into a rosemary bread machine recipe–just whip up the dough in a bread machine to save time, for a fresh baked loaf of rosemary bread that will have you craving even more. You really cannot go wrong with this Rosemary Bread Recipe. Our readers are constantly emailing us telling us how much they LOVED the recipe. It’s the perfect bread to accompany SO many meals. We love it paired up with anything from Chili Mac, to Chili to our favorite soups and stews, and even using it for sandwiches with our Chicken Salad. Combine the yeast, sugar and ¼ cup of water in a large bowl. Let stand for 5 minutes, until foamy. In the same bowl, add 1 tablespoon of olive oil, 1 ½ tablespoons rosemary, fine salt, ¾ cups warm water and all the flour. Mix with large spoon until dough forms. Then work dough by hand on a lightly floured surface for about 5-7 minutes. Rub olive oil on the inside of a clean bowl and put the dough in, cover with saran wrap or a cloth and let stand for 1 hour. The dough should have doubled in size by this time. Place a sheet of parchment paper on a baking sheet. Next, place the dough on a lightly floured surface and divide into 2 halves. Knead each piece for a minute or so, sprinkling with flour, as needed and work into a ball. Place each loaf on the prepared baking sheet. Let stand, uncovered, for about 1 hour or until dough has doubled. Preheat oven to 400 F. Bake the loaves for 10 minutes. Remove them from the oven and brush with the remaining olive oil. Sprinkle with the kosher salt and pepper and crumble the remaining rosemary over top of the loaf. Return to the oven and bake for another 10-12 minutes, or until golden brown. I love to bake bread, and this looks great. I’ll try it! We don’t have a Macaroni Grill in my area but if we did, I’d definitely order that bread, it looks delicious. Pinning your recipe. Thanks for sharing with us at Merry Monday. Looks like a delicious bread, Jessica. I love the wonderful flavour Rosemary adds to so many dishes! Thank you for being a part of the Hearth and Soul Hop. This looks amazing. I want to try this sometime. Thank you for sharing with us at #HomeMattersParty. We would love to have you again next week. Can’t wait to try this! Funny thing is some friends and I were just talking about macaroni grills bread today. 🙂 Thanks for sharing he recipe with SYC. Your Rosemary Bread is on my menu for next Friday, Whats For Dinner Next Week, can’t wait to try it. Thanks so much for the awesome recipe! It is important that people understand that there are two separate raise periods for this bread – each lasting one hour. So, if you are reading the 1 hour 35 minutes as a total time (prep plus bake) you will be off by an hour. I noticed that too. They should really change that. Thanks for the note. This has been updated! I’m catering a fancy formal dinner for 40. The hostess requested Rosemary Rolls. I tried this recipe using my bread machine. I make bread often for my family but never eat it myself. When these came out of the oven, I tried one and ended up eating 3! These are to die for! The only change to the recipe I made was I added a little fresh ground pepper. Trust me…these are delicious. Love hearing about this! I hope your dinner was a success! The site is broken… you can’t actually see the ingredients or instructions! Thanks for bringing this to my attention- it is working again and the recipe is there. I’ve already made this Rosemary bread and it is wonderful! Just 2 questions: why is fine salt listed twice in the ingredients and ground pepper is in the ingredients but no mention when to add it? Thanks for the note. I’ve edited the recipe to take out the duplicate salt and to add in where to add the ground pepper. Sound like you’ve had success making this recipe. Yum! I just made this recipe yesterday, and it came out wonderfully. My brother tried it and couldn’t believe I had made it. I am proud, especially since this was my very first bread making experience. So glad I made this one, so delicious for dinner, or even for a breakfast sandwich. Have made this many times. Wonderful! Novice Baker with a bread machine here.. what settings do you use for this bread on your bread machine?? Ok this is my first real adventure making bread and I have to say this was amazing. My only regret is that I have the other loaf to my neighbor but I’m definitely sharing this and making it again. Only thing I did differently was substitute barley malt for the sugar and used instant yeast. That sounds delicious with your substitute. Note to self–make 4 loaves next time. 2 to share and 2 to eat. 😉 Enjoy! I usually only cook for one. I love homemade bread but usually the loaves are so big. I like that these are small loaves. My question is can these be frozen? If so, what’s the best way to bring them back to life? I’m sure the bread can be frozen, although I haven’t done so myself. I imagine thawing it and then warming it by the slice for 10-15 seconds in the microwave might do the trick. Looks wonderful going to try it! 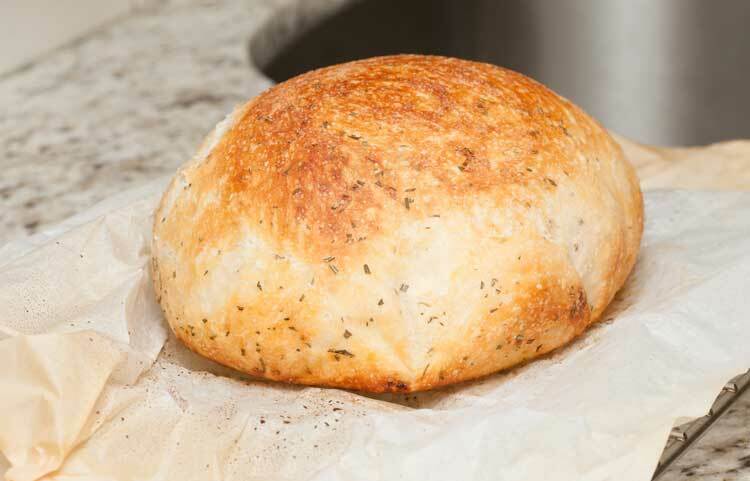 We love this type of bread toasted it really brings out the rosemary flavor! Teaspoon of pepper with the rosemary and flour. This recipe is a keeper for sure!!!! What would you change if you wanted to make the dough in a bread machine? Do you need to use different yeast? Or would you keep everything the same? Thanks! Really excited to try this recipe. I have not made it in a bread machine, so I’m not sure. Let us know how it goes in the bread machine if you try it. Is it okay to leave half of the dough in the fridge for a day if I dont want to bake both of them at the same time? I’m a bread-making beginner…. followed the recipe and the loaves ended up very small. Not sure where it went wrong? Maybe I didn’t let it rise long enough? I used your recipe and baked the bread in a wood fired oven, it was fantastic! It’s an easy to follow recipe especially for a beginner bread baker!